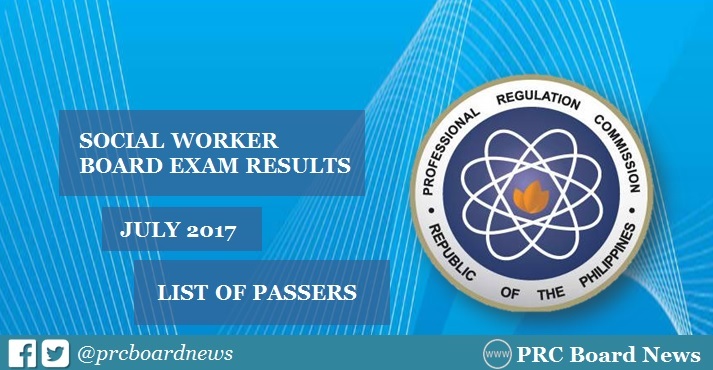 MANILA, Philippines - The Professional Regulation Commission (PRC) officially released on Wednesday, August 2, the July 2017 Social Worker board exam results to include the full list of passers, top 10 (topnotchers), top performing schools and performance of schools. A total of 3,951 out of 5,997 (65.88%) passed the Social Worker Licensure Examination given by the Board for Social Workers in the cities of Manila, Baguio, Cagayan de Oro, Cebu, Davao, Iloilo, Legazpi, Lucena, Pagadian, Tacloban, Tuguegarao and Zamboanga. The members of the Board for Social Workers who gave the licensure examination are Lorna C. Gabad, Chairman; Mary Ofelia L. Endaya, Rosetta G. Palma, Fe J. Sinsona and Ely B. Acosta, Members. From August 7 to August 8, 2017, registration for the issuance of Professional Identification Card (ID) and Certificate of Registration will be done on-line. Please go to www.prc.gov.ph and follow instructions for initial registration. Those who will register are required to bring the following: Notice of admission, duly accomplished Oath Form or Panunumpa ng Propesyonal, 2 pieces passport size pictures (colored with white background and complete name tag) and 2 sets of documentary stamps. Successful examinees should personally register and sign in the Roster of Registered Professionals.